Christmas is finally here! It's truly the happiest time of the year with lots of love, gift-giving and memorable moments with the family. The excitement grows as the Christmas countdown gets nearer and nearer to the big day. We can feel it in the air, hear it in the Christmas carols, and see it in the lights and decorations popping up everywhere. Retail giant SM Mall of Asia kicks-off the holiday festivities with the traditional lighting of the Grand Christmas Tree at the Main Mall Atrium. For the grandest and most magical Christmas experience in the metro, SM Mall of Asia has a lot in store for its shoppers and it began on November 11, 5pm as they lit up their Grand Christmas Tree. 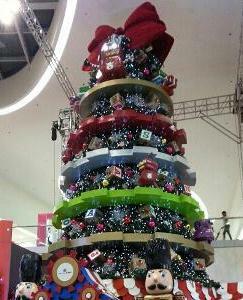 SM MOA VIPs together with special guests launched the majestic 50-foot tree decked in twinkling lights and amazing toys. Santa Claus also joined in the fun when he brought the toys to life with a little magic for everyone to see! Leading the ceremonies were SM Prime Holdings President Hans Sy (far right) together with (L-R) Eden Calixto, wife of Pasay City Mayor Tony Calixto,Marlon Pesebre, Pasay City Vice Mayor and Santa Claus. The whole mall felt the warmth of Christmas as they were serenaded by the UP Singing Ambassadors and OPM legend KuhLedesma together with her equally talented daughter Isabella. A giant 50-foot Christmas tree at SM MOA! Amazing! SM MOA's Toy Wonderworld came to life when the Philippine All Stars, dressed as everyone's favorite toys, stole the spotlight for an exciting dance number that the whole family enjoyed! Have fun and get a chance to meet and greet different well-loved toys and cartoon characters as they come alive every weekend until the New Year. It definitely is a Christmas Toy Wonderworld at the mall for the kids and kids-at-heart! Party with the Monster High Crew on November 17; cuddle up to the Sylvanian Families the following weekend on November 24 to 25. The Power Rangers are all set for a merry morphing time on December 1 and 2. And everybody’s favorite orange cat Garfield and his doggie sidekick Odie will be at MOA to play on December 8 and 9. Get awesome gift ideas at the Hasbro Grand Toy Fair from December 13 to 19. Families can also meet the legendary toys Mr. Potato Head and Play Doh Tubby on December 15 and 16. Then on the following weekends you can cuddle up with the dainty Lalaloopsy dolls from December 22 to 21, 29 to 30, and January 5 to 6. Kids can find out from Santa Claus himself if they’ve been naughty or nice because SM Mall of Asia is giving everyone a chance to share all their Christmas wishes to the big huggable man in red! He’ll be waiting under the tree from 2pm to 5pm every weekend until Christmas Day. Families will also be amazed with larger-than-life toys covered in bright twinkling lights during SM Mall of Asia’s 5th Grand Festival of Lights Parade happening every Saturday at 5:30pm from December 1 to 22 and on Christmas day itself. To make Christmas even more meaningful, SM MOA and its mall-goers can celebrates the season of giving by sharing their blessings through SM Cares’ Bears of Joy project. For just P100, take home a cute and cuddly teddy bear because all proceeds will be donated to various orphanages and charitable institutions supported by this project. With a full schedule of celebrations ahead, enjoy a fun and abundant holiday season with your family and friends as you discover a magical Christmas Toy Wonderworld only at SM Mall of Asia.